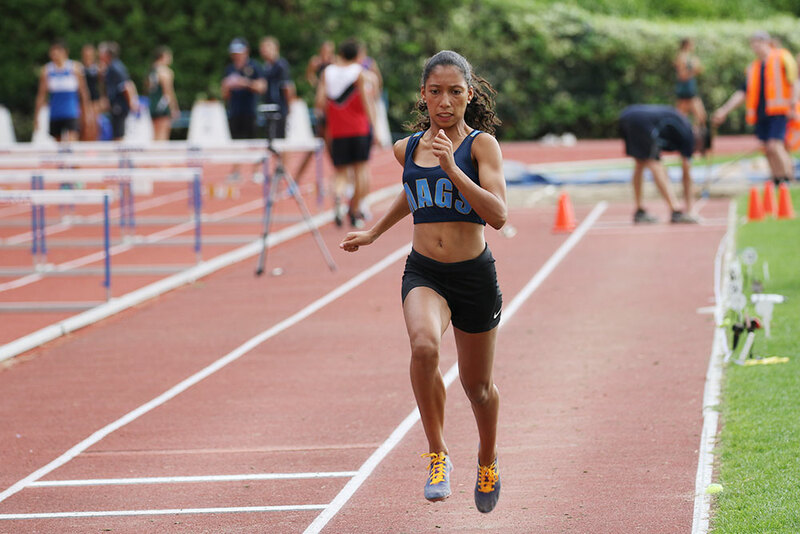 MAGS athletes brought back five Gold medals from the Auckland Secondary Schools Athletics Championships held at Mt Smart Stadium yesterday. Two of those Golds were won by Zayyaan Smith (pictured above), who was victorious in the Junior Girls Long Jump and the Junior Girls 200m (in which she broke the school record), as well as winning Silver in the Junior Girls 100m. Luke Clements won the 2000m Steeplechase and was also awarded College Sport Auckland Best Performance from the meet. Gold medals were also won by Te Waaka Popata-Henare in the Junior Boys Javelin and Hannah Adye in the Open Girls Pole Vault. There were also strong performances by Latonya Lole, who won Silver in the Intermediate Girls Long Jump, and Dylan Moon, who won Bronze in the Senior Boys 300m Hurdles. Tama Anderson also won Bronze – in the Intermediate Boys 100m – and teamed up with Eamon Buick, Troy Middleton and Shaun Harden for Bronze in the Intermediate Boys 4 x 100m relay. A total of 34 students took part in the meet, with school records set by Ruby Pengelly in the Junior Girls 1500m, and by Latonya Lole, Princess Elliot, Lorna Faalogo and Kalisi Longopoa in the Senior Girls 4 x 100m Relay.